It was with a great deal of sadness, humiliation and some anger that [Child] came home today with her writing assignment "Imagine you are an orphan. In 5 sentences, tell how you would feel." [Child], as you are well aware, does not have to imagine. She is an orphan. Any child who has lost a parent, be it through death or abandonment, is an orphan. While we realize that this is most likely a standard assignment that is given out to your 5th graders, we would like to take this opportunity to point out that it is, indeed, quite insensitive to any child who has lost a parent, for whatever reason. In [Child]'s particular case, this assignment is downright cruel. You know that she comes from an orphanage and you know that [additional details of child's background]. These are things that we have shared with you in an effort to protect her from such insensitivity. Frankly, we are at a loss as to how she could have come home with this paper! Participating in a writing assignment such as this could only serve to dredge up horrible memories and feelings for her, and could very well trigger an episode of severe Post-Traumatic Stress Disorder for her, as well. In this day and age, there are many, many definitions of the word "family." Some people adopt children. Some come from broken homes -- their grandparents, aunts or uncles are raising them; some come from the foster care system here in the United States; some come from abroad -- China, Vietnam, Columbia, Russia. Although they all have different circumstances, they all have one thing in common -- they all ARE orphans. They don't have to imagine it. They live with that knowledge every single day of their lives. They don't necessarily want anyone else to know about it. It's their private business, the most intimate part of their lives. Certainly not something to be written about for a class project. 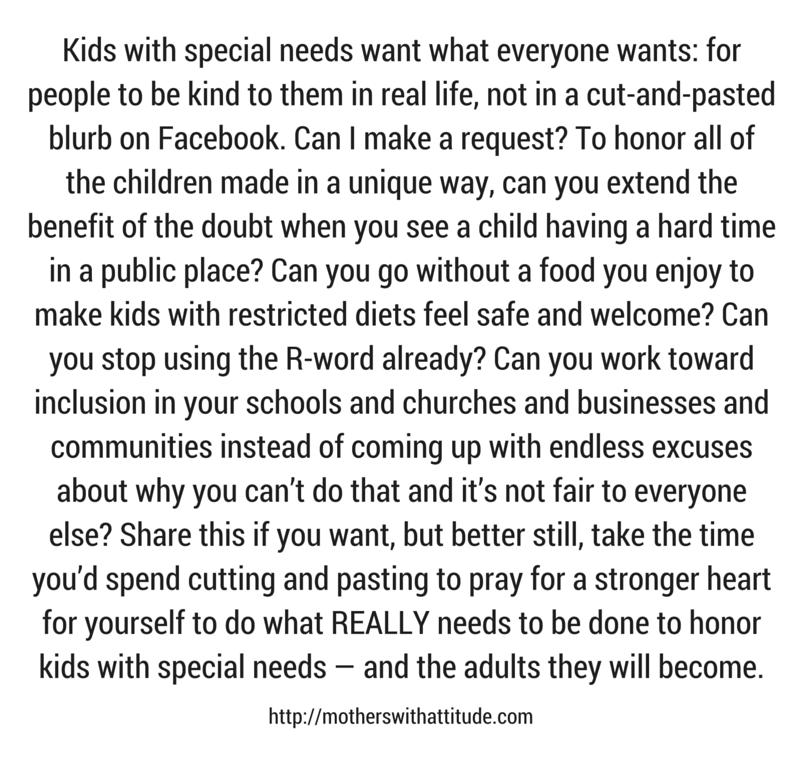 This is also certainly NOT something that a child who is in a self-contained special education class could possibly separate from his or her own personal experience. Asking a child who has lived through horror and trauma, the likes of which you could never imagine, to step outside of that experience and write as an outsider is completely impossible. Frankly, not many adults would be able to do that. The scars of being orphaned take a lifetime to heal. This healing is done through years of therapy, reassurance, loving commitment and hard work on the part of everyone involved -- parents, child and supporting network. Although many children have a lifetime of nurturing, they will never truly heal from the wounds of being abandoned, neglected, orphaned. For sure, this is something that no child should have to address in the forum of a written essay for a class project. What about the kids who lost parents in 9/11? Would we be making them relive their horror for a class assignment? No. Why should any other child who may have suffered a loss that is just as traumatic to them have to relive it? This assignment is beyond comprehension to anyone who has had a child suffer any parental loss. We know that you are a caring and kind teacher. We truly believe that this assignment MUST have been an oversight on your part, perhaps you have not taken the time to contemplate the harsh impact an assignment like this could have on a child such as [Child], or any child who has lost a parent through any circumstance. We will not force [Child] to participate in this assignment. Please realize that we are not trying to be difficult here, but rather are trying to explain that this caused a truly miserable situation for a sweet little girl who already has too much emotional garbage in her life to deal with. We simply will not make her delve into these feelings for anyone but a therapist, and even then, only if and when SHE is ready to do so. Thanking you in advance for your continued cooperation, support and understanding.